Bleed Eagles Green: Philadelphia Eagles Blog: Sheppard, Brown, and Samuel: How Do They Measure Up? Sheppard, Brown, and Samuel: How Do They Measure Up? Back when the Eagles were dominating the NFC East one of their greatest strengths was their defensive backfield. The Eagles had three starting caliber cornerbacks in Bobby Taylor, Troy Vincent, and Al Harris. Oh yea, the also had a safety named Brian Dawkins. During the early years of their run to four straight NFC Championship Games (2001 and 2002) the Eagles’ cornerbacks were dominant. Fast-forward to the Eagles 2008 season and we see a similar position of strength with the cornerbacks. The Eagles again have three starting caliber cornerbacks in Sheldon Brown, Asante Samuel, and Lito Sheppard. Oh yea, Dawkins is still around too. Though there are only two starting spots, it is a problem most teams wish they had. Taylor, Vincent, and Harris were on the field together for the 2001 and 2002 seasons. Taylor and Vincent were the starters and Harris was the nickel cornerback. In 2001 the trio posted six interceptions and 54 passes defended. In 2002 they posted 8 interceptions and 46 passes defended. The low numbers were more a result of opposing teams not challenging the corners than poor performance. Vincent went to the Pro Bowl in both 2001 and 2002. Taylor was a Pro Bowler in 2002. Harris, though not a Pro Bowler, laid a strong foundation for an eventual starting position with the Packers in 2003. The 2008 trio also boasts two Pro Bowlers. Sheppard is a two time Pro Bowler, while Samuel is coming off of his first Pro Bowl season in 2007. Brown seems to be on the cusp of a selection every year. The numbers for Samuel and Sheppard also paint an impressive picture. In the past two seasons Samuel has collected 16 interceptions. In 2004 and 2006 (years where Sheppard avoided the injury bug) Sheppard had 11 interceptions. Brown, also a strong cover corner, has become known for his bone crunching hits and his iron man streak. 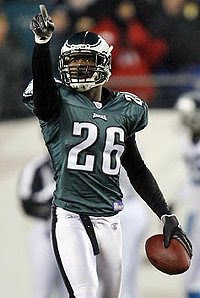 Since breaking into the league in 2002, Brown has appeared in all 96 regular season games for the Eagles. Where I believe the 2008 group separates themselves is their big game experience and big play ability. Brown, Sheppard, and Samuel have each appeared in a Super Bowl. Samuel has played in three Super Bowls, while winning two. Each knows what it takes to achieve team success. Both Samuel and Sheppard each have a knack for the big play. The two have combined to score six touchdowns off of interceptions. Sheppard has multiple returns off 100 plus yards. The big question now for Brown, Sheppard, and Samuel is if they can dominate and win together? Vincent, Harris, and Taylor have already shown their ability to carry the Eagles to the Championship level.